Desmond the tabby cat is ready to spend Christmas at home in Kenilworth, Warwickshire, after spending three months as a stray in North Devon. The seven-year-old moggy was on holiday with his owners Jim and Mary Hall when he went missing in September, but was eventually found by concerned holidaymakers and handed in to the local vets. 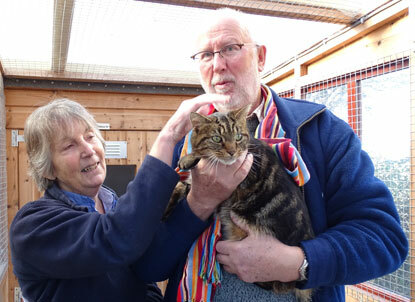 Desmond’s microchip details had not been updated and so he was transferred to the care of Cats Protection’s Barnstaple Branch in December, where volunteer Kay Twine made it her mission to track down his owners. After discovering that his microchip was last registered in the Coventry area, Kay called all of the vet practices in the region hoping to find out where his owners had moved to. She eventually found Desmond’s original owner, Mark Langan, who revealed that his parents-in-law, Jim and Mary Hall, had adopted the cat from him three years ago. He said they had often taken Desmond with them when they visited North Devon on holiday, but when he went missing they had to return home without him. Jim Hall said: “We were absolutely delighted to hear that Desmond had been found alive and well although a little skinny. Our reunion was delayed by a few days because of the snow, but as soon as we could we made the return 195-mile journey to collect him and bring him home. It was a lovely and unexpected Christmas present for us, and our three-year-old grandson Toby who is overjoyed. To find out more about the importance of microchipping your cat, please visit the Cats Protection website. The latest video in the Simon’s Cat Logic series deals with the topic of catnip – the plant that cats go crazy for. Simon explains that his tabby Maisy was the inspiration for his catnip animation, as she would go completely loopy for two catnip plants he put in his garden. By chewing the leaves and rolling around on top of them she decimated the plants, prompting him introduce a rotation system to give them a chance to recover. Cats Protection’s Behaviour Manager, Nicky Trevorrow, explains that catnip is a perennial herb that comes from the plant catmint or Nepeta cataria. It’s the chemical nepetalactone that causes cats’ curious response, but it is often short-lived and does not cause them any harm. Nicky goes on to show how catnip can be used to encourage your cat to use their scratch post and reveals what percentage of cats are affected by the plant. You can then watch Simon’s adorable animation showing his cat going gaga for a catnip toy and causing all sorts of havoc in the process. Watch more Simon’s Cat Logic videos on YouTube and learn more about catnip with our fascinating blog post. This year’s Christmas animation from Cats Protection is a festive tale with a difference, taking inspiration from a true story. If you haven’t yet seen the tear-jerking animation, it features 16-year-old ginger cat Kozal as he waits in an adoption centre to be rehomed. What you might not know is that Kozal is a real cat – once in the care of Cats Protection’s National Cat Adoption Centre in Sussex. The Cats Protection Christmas animation focuses on Kozal’s time in the centre as he slowly becomes more dejected when he is overlooked in favour of other cats. Thankfully, there is a happy ending – just like the real Kozal, he soon finds a special someone. The real Kozal has managed to settle nicely into his new home too. “He loves to sit in front of our French doors and watch the birds. He is a real feisty character and we are starting to recognise the different miaows he gives us,” says Jill. If you’re looking to give a cat a home, click here to find a cat on our website. If you’re making your way through the last of your Christmas shopping, you might be considering what to get your furry friend. If you’ve seen our 12 ‘nays’ of Christmas animation, you’ll be aware that the toys you buy will need to be safe for your cat to enjoy. To give you a helping hand, take a look at our top picks of festive gifts for you cat. Cats love a place to hide, especially at Christmas time when your home can often be noisier and busier than usual. 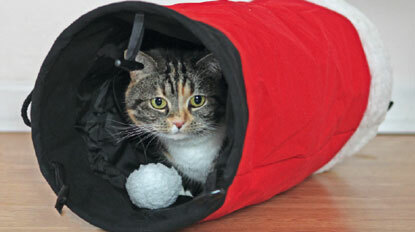 This novelty play tunnel is an ideal gift to keep your cat calm throughout the festive season. 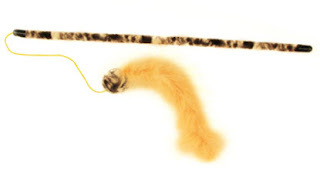 This Feathered Boa Cat Toy is a great choice to keep your cat busy. 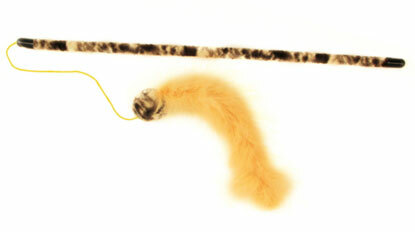 Great for chasing, toys like this simulate your cat’s natural hunting behaviour. It also provides good exercise and can help strengthen your bond with your cat. If you’re seeking a fun gift this Christmas, these FreakMEOWt catnip toys fit the bill. 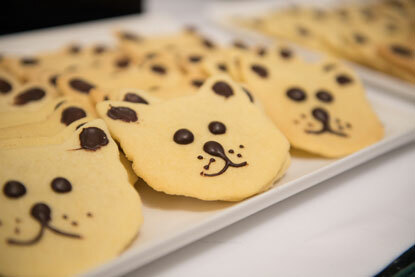 Lovingly handmade and stuffed with catnip, they’re guaranteed to drive your cat wild. 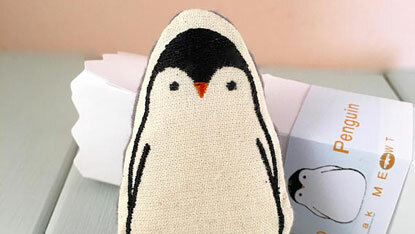 They also come in a variety of different shapes including fish, doughnuts and even festive penguins! If you’d rather have a go at making your own cat gifts this year, take a look at the handy how-to videos on our YouTube channel. While human festive treats like chocolate and Christmas pudding shouldn’t be eaten by cats, you can make your own edible gifts with our step-by-step guide. Got a leftover Christmas jumper from last year? Treat your cat to the ultimate gift – a homemade cat bed with a festive feel. Purrfect! If you’re ordering from the Cats Protection shop, you’ll need to make your order before 12 noon on the 19 December to receive your order by Christmas Eve. With Christmas just over a week away, you've still got time to deck the halls. 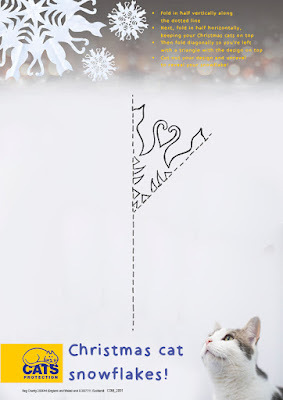 If you don't fancy boughs of holly, how about our crafty cat-themed snowflakes? They're the perfect decoration for your home or office, as well as being very easy to make. Got little ones helping you? Make sure there is always an adult present to help when using the scissors as it can get a bit fiddly. Fancy showing us your handiwork? We'd love to see your cat snowflakes. Tweet us @CatsProtection with your pictures. While Christmas is a time of merriment and joy for humans, cats can often find themselves confused by the festive season. Strange scents and foods enter the house, along with odd-looking decorations and unfamiliar people. To help cat owners look after their feline friends during the festive period, we’ve put together a 12 ‘nays’ of Christmas animation. Made up of 12 easy-to-understand top tips, the animation offers advice on everything from gifts to give to your cat, to toxic plants that could cause them harm. Are you concerned about keeping your cat calm when the family are around, or perhaps you’re not sure what you can and can’t feed your cat at Christmas time? With our 12 top tips, you can have a hassle-free festive season that both you and your cat can enjoy. Every year, parliamentarians from all parties speak up for cats on important issues such as air gun licensing and kitten sales. 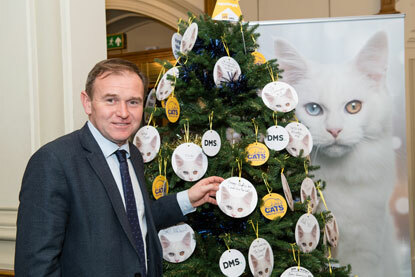 To thank them for their support, Cats Protection invites them to our annual Christmas reception at the House of Commons for festive fun and refreshments. This year we were delighted to welcome more than 60 MPs and peers to the event on Tuesday 5 December, which was hosted on our behalf by Kevin Foster MP and supported by Direct Marketing Services (DMS). Representatives from other animal welfare charities and professional organisations we work with were also in attendance. Guests were given the opportunity to play our ‘find the sleeping cat’ game to test their knowledge of feline behaviour, and to personalise a bauble for our cat-themed Christmas tree complete with giant cat banner. Among those attending were Lord Gardiner, Parliamentary Under Secretary of State for Rural Affairs and Biosecurity, and George Eustice, Minister of State at the Department for Environment, Food and Rural Affairs, who adopted his cat Gus from our Mitcham Homing Centre in 2016. 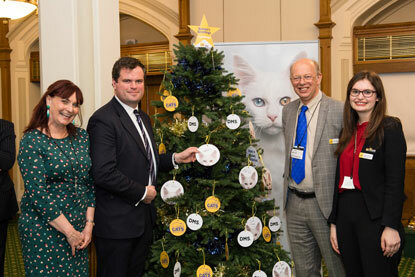 Jacqui Cuff, Cats Protection’s Head of Advocacy & Government Relations, said: “Cats are one of the nation’s favourite pets so it was wonderful to welcome so many politicians to our Christmas Reception. “It has been a busy year, with our major campaign on kitten sales, our 2022 Agenda for Cats launched ahead of the General Election, and our petition calling for licensing of air guns in England and Wales in line with the new licensing regime in Scotland. The latest video in the Simon’s Cat Logic series is focused on the festive season. Christmas can often be a confusing time for cats, as Behaviour Manager Nicky Trevorrow explains. Unfamiliar scents, sounds and people can have an effect on stress levels too. Nicky gives plenty of advice on how to survive Christmas with cats in the home – from keeping decorations out of reach to ensuring your cat stays calm. Simon explains that his cat Hugh was the inspiration for his short Christmas animations. He talks about the first year that Hugh arrived and his obsession with the Christmas tree. “He soon became quite the climber!” he exclaims. Nicky explains that while cats love Christmas trees, it is best to ensure you have a sturdy base – this ensures the tree doesn’t come crashing down if your cat decides to climb it. She also points out that baubles and unwrapped gifts can be potential hazards and should be placed out of reach. The five short Christmas animations at the end are each focused on a different part of Christmas. ‘Santa Claws’ looks at a cat’s obsession with trees while ‘Sticky Tape’ focuses on the perils of gift wrapping with cats around! ‘Little Box’ shows a cat enjoying a cardboard box – the ideal Christmas gift for felines, and ‘Fowl Play’ is centred around a cat attempting to get hold of a delicious Christmas turkey.